Today am sharing a look from a friend’s wedding that I attended sometime back. Wedding dress up has become fun since I made this magical decision to not wear dresses. Please don’t get me wrong, I just got tired of getting dresses that I put on once then hang for the rest of their stay in my wardrobe. Since there have been so many weddings to attend this year (dear future husband, kindly consider this a sign). I have found ways to play around with accessories either a bowtie, suspenders or cummerbund to make an otherwise ordinary look, be elegant. 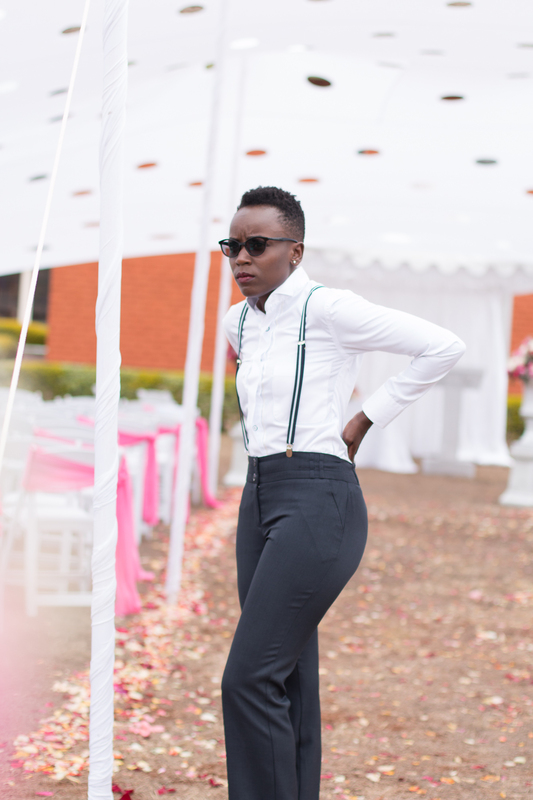 As for this look, all I needed was the suspenders to elevate the combination. I totally loved the final result. Any thoughts? Feel free to leave your comments. woow! looking superb.Now start wearing dresses ,you never know the look that will come.I believe it will outstanding.